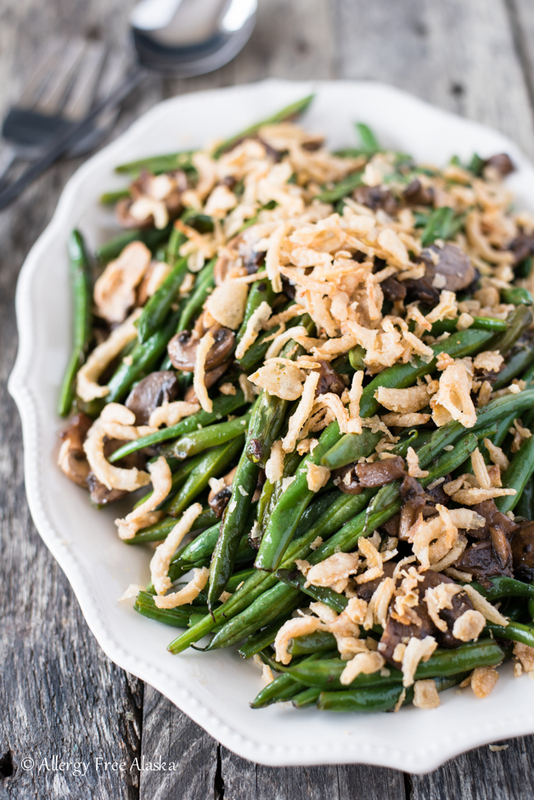 Made with just a handful of ingredients, this easy Gluten Free Sautéed Green Beans and Mushrooms recipe will compliment any meal this holiday season! Enjoy these tasty green beans with Garlic & Herb Crusted Beef Roast and Gluten & Dairy Free Dinner Rolls for a dinner your family won’t forget! Saturday, I was grocery shopping in my pajamas with a cup of coffee in hand – all from the comfort and convenience of my own living room! It was glorious! Have you used Fred Meyers grocery pickup yet (formerly called Click List)? They don’t have all the items in the store available for this service, but a good amount of the items are. I’ve used it a handful of times, and it’s great. No crazy people, no fighting crowds, and no lines! You know how the stores can be CRAZY right before the holidays? Yeah, well… if you want to avoid all that chaos, try ordering online. You’ll love it! When putting together my grocery order this past weekend, I stumbled upon some gluten-free French Fried Onions (Kroger brand). I was so excited! I never knew we had these available locally, so I felt like I won the lottery! 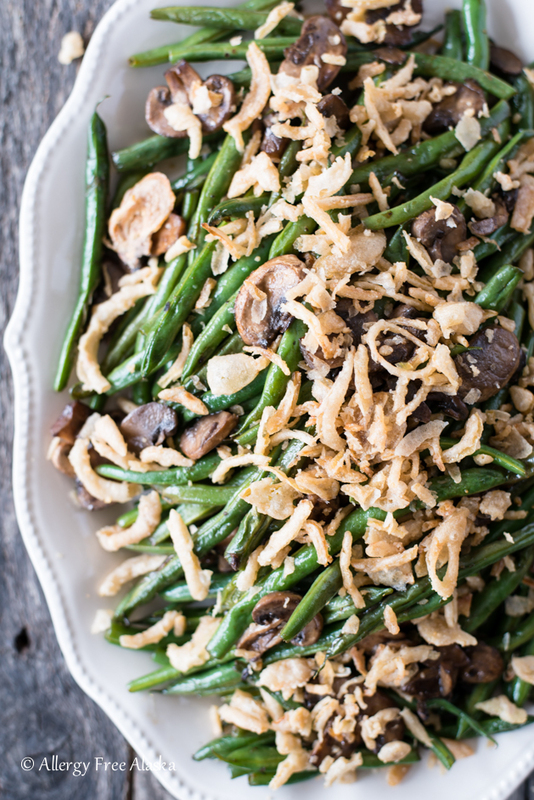 Green Bean Casserole has always been a favorite dish, but after finding the gluten-free French Fried Onions, I wanted to recreate a healthier side dish. One without diary-free milks, that might make the end result taste funky (because let’s face it, that’s reality), or starches. I choose to sauté fresh green beans in a skillet with ghee until they were tender (you can use vegan butter or coconut oil if you don’t tolerate ghee). Adding a bit of water to the skillet helps steam the green beans so they cook quicker. I continue sautéing the green beans until they start to get a bit of color on them (caramelization… or FLAVOR! ), and then add to the pan sliced button mushrooms, Braggs Liquid Aminos, and garlic powder. 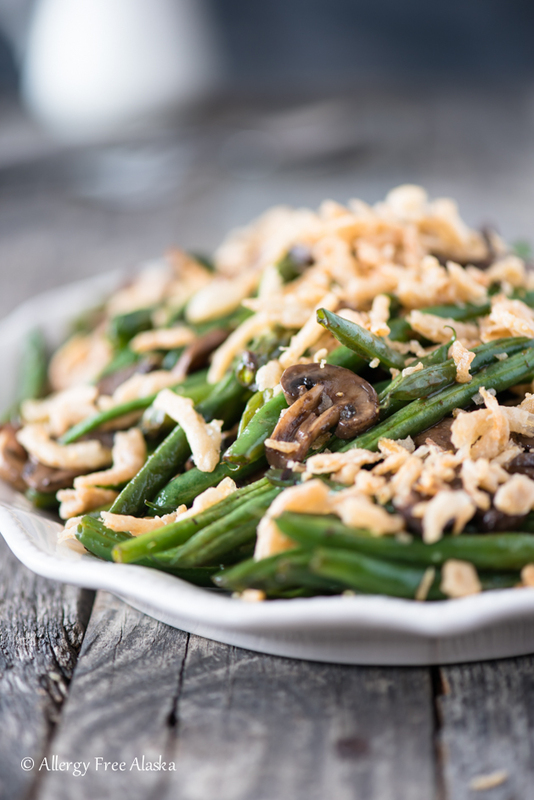 The Braggs Liquid Aminos gives the green beans a bright umami/salty flavor that will quite literally keep you coming back for more. When the dish is done, I top it with gluten-free French Fried Onions. 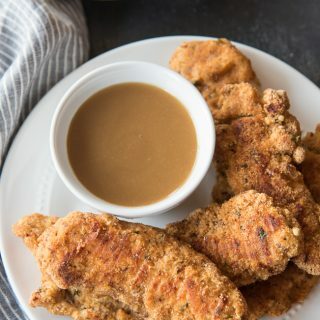 I love the crispness and texture of those irresistible morsels! I found my gluten-free French Fried Onions at Fred Meyer, but I’ve also heard from other readers that they are available at Aldi’s. Wishing you all a wonderful holiday season with your families! May there be lots of laughter, smiles, and memories made! 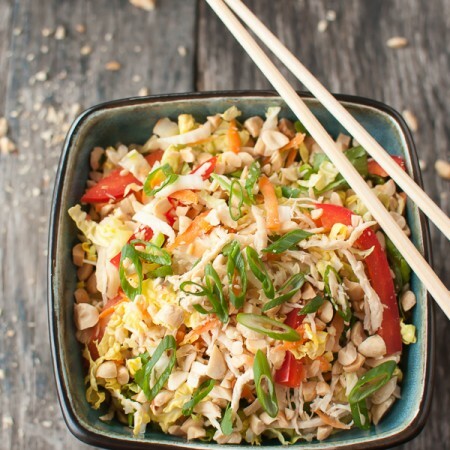 With LOTS of amazing gluten-free food! Melt the vegan butter or coconut oil over medium-high heat in a 12-14 inch skillet (I love my 12” Lodge cast iron skillet). Add the green beans and sauté 2 minutes. Add the water to the pan, and continue to sauté until tender, about 6-8 more minutes. The water will evaporate as you sauté the green beans, and steam them. If at anytime your pan gets too hot and your beans start to burn, turn your heat down to medium. 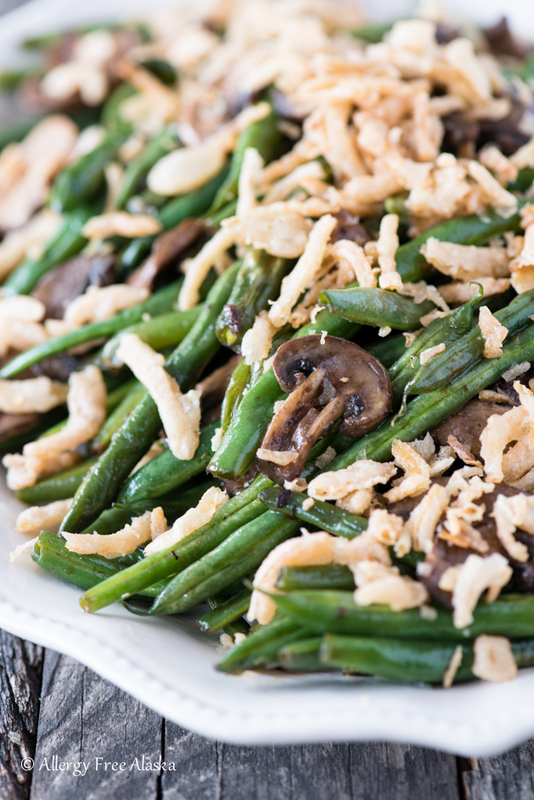 You want the green beans to caramelize, but you don’t want them to burn. 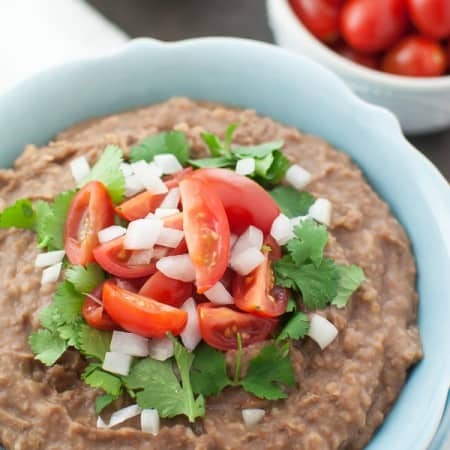 If the water evaporates from the pan too early, add another 1-2 tablespoons of water (this will also help keep the beans from burning). Add the sliced button mushrooms, Braggs Liquid Aminos, garlic powder, and black pepper. Sauté for an additional 2 minutes, or until the mushrooms are cooked through. 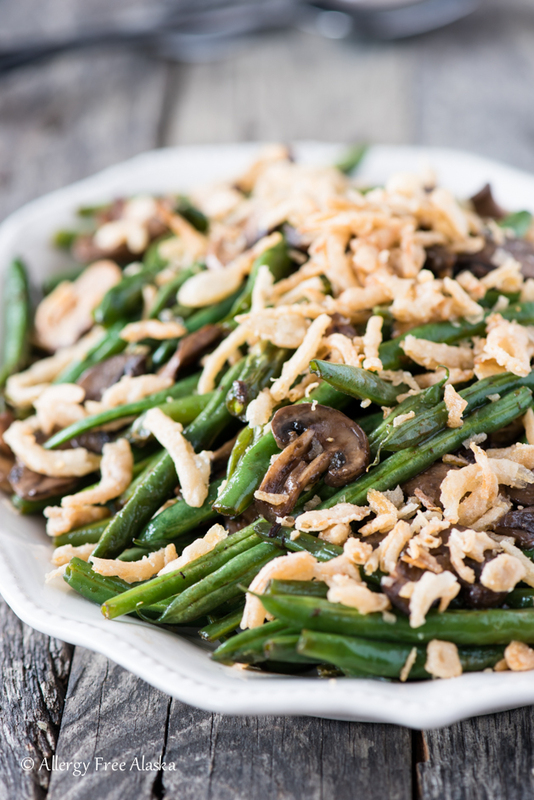 Transfer the sautéed green beans and mushrooms to a platter and garnish with gluten-free French Fried Onions.